It’s that time of year again…back-to-school, back-to-college, and the frenzy is under way to make sure your child has the perfectly stocked dorm room so you can rest easy as a parent, knowing they have everything they could possibly need to study hard and not get homesick. At least that’s where my mind goes as I get my son ready to head back to school two states away from me. While a lot of blog posts this time of year focus on how to decorate that perfect room, as a #boymom I like to focus more on the practicality and function of the dorm room. Also, I have the benefit of having seen what my son’s dorm room looked like during freshman year Parent’s Weekend, and trust me, decor was the furthest thing from my mind. Matching comforter sets and curtains? How about a hazmat suit and a blow torch? All kidding aside, here are the ten essential items I’ve found at The Container Store that will make the most of their limited space and make their home away from home functional AND comfortable! Let’s go through all of these items one by one…because some of these need a little explanation! The key to setting up a dorm room is to optimize space, because there just isn’t enough. I can’t stress enough how important it is to loft the bed. It creates so much more storage. When my son lived in the dorm, he decided to loft his bed at the medium height, about 3-4 feet off the ground. 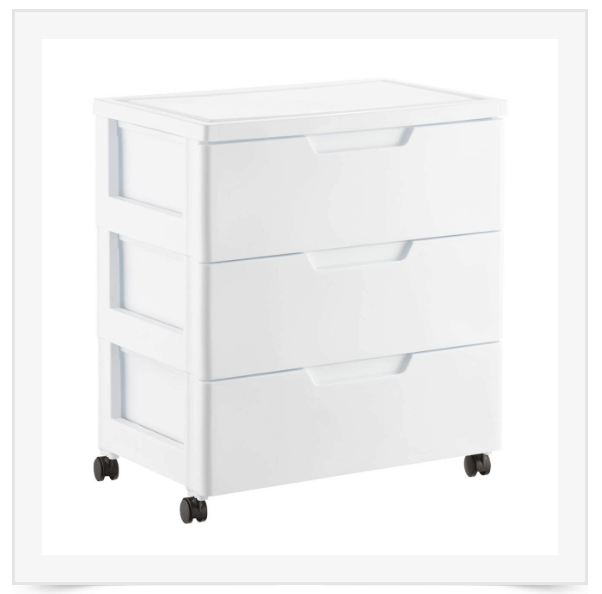 That way he could put stacked plastic storage drawers, plus the provided dresser, underneath the bed and free up floor space. The downside to that is that you lose a functional nightstand, since your bed is so high up. The solution-one of the above caddies or organizers. They can keep their phone, books, iPad, whatever essentials they need close to hand without taking up any space. Now that the bed is lofted, you can roll this sucker right underneath it, or but it in the closet. There’s never enough drawer space, and what I like about this option is that the drawers are 6 inches deep and made of a VERY sturdy plastic. This will hold up to a year’s worth of wear and tear and then some. It’s also quite versatile-it can be used as nightstand in a future apartment or in an office at some point as well. Another common theme is multi-tasking. 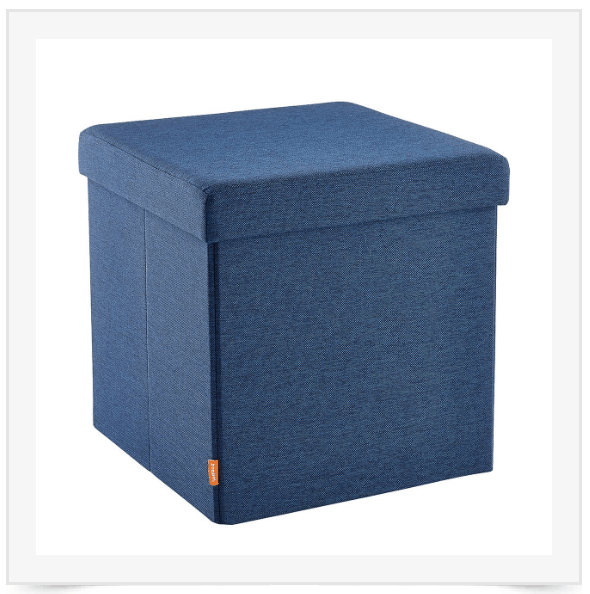 This little box comes in 8 colors, can store all sorts of things, serve as an extra seat for entertaining friends (it can hold up to 275 pounds) and you can even use it to help climb into bed after a long night of studying. Because that’s what they’re doing out late at night, right? Studying! 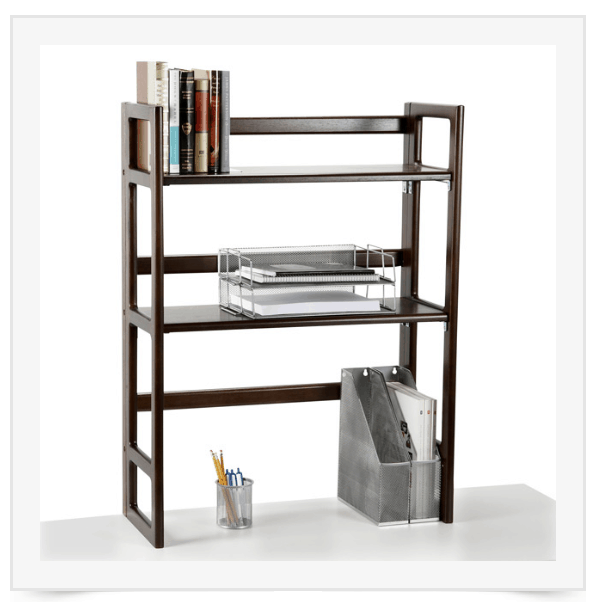 This hutch is ingenious-you can use it on the floor as a little bookstand, but it’s really meant to go on top of the desk to give you more storage. I noticed there’s really nowhere in a dorm room to put books, school supplies, etc., so this is perfect. It’s also a great place for makeup, a TV, all sorts of things that don’t have a home in the room. Note that you can also still slide a computer underneath it-there is lots of clearance. It also folds completely flat to make it easy to get it to and from school. 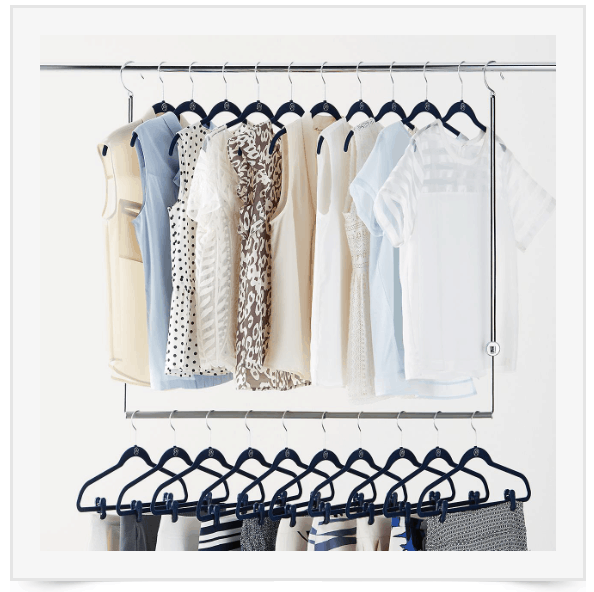 There is NEVER enough hanging space in the closet. This is indispensable. Get it. Another great space saving idea, and more storage. The dorm room has to function as bedroom, living room, study and kitchen, and this little cart can be your whole “kitchen”. Store plates, eating utensils, etc, in one drawer, and nonperishable snacks in the other. If you don’t use the wheels it can hold up to 125 pounds! It can also double as a TV or printer stand, nightstand, etc when you’re out of the dorm. There’s also never enough outlets in a dorm room. 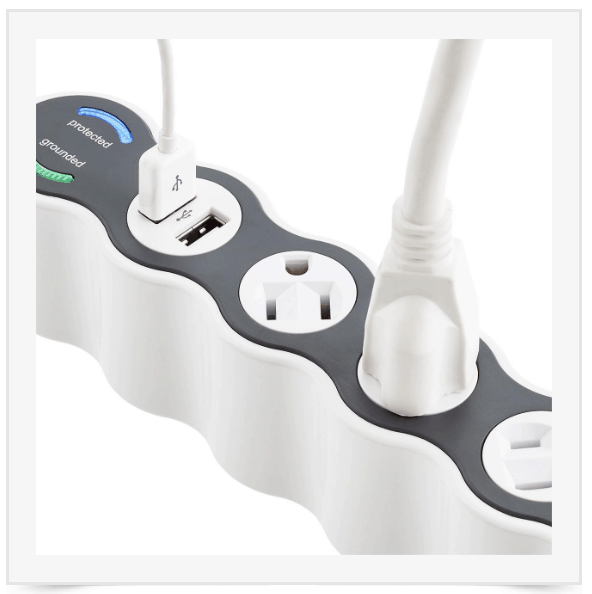 Most colleges require power strips to also have a surge protector, which this one does, but it also has two USB ports AND the outlets themselves rotate to accommodate awkward sized plugs. Love it! Communal living can be a lot of fun (who doesn’t want to live with several hundred of their closest friends with little to no adult supervision) but it also means exposure to a lot of new germs. 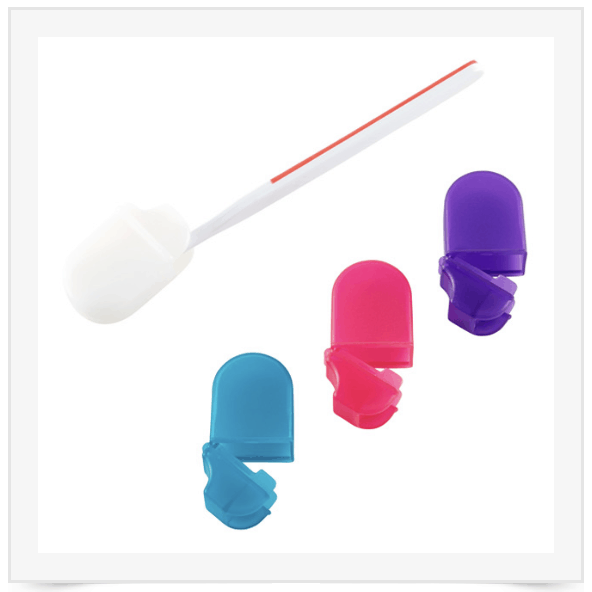 These little guys protect your toothbrush and also are so inexpensive (under $2) that if you lose one it’s not the end of the world. 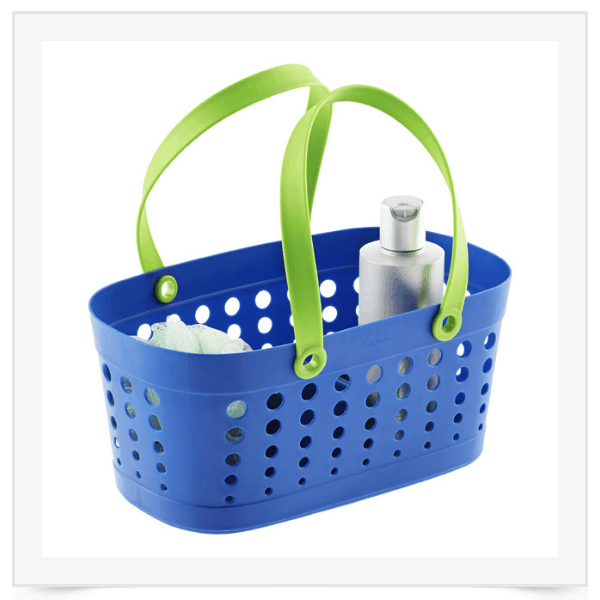 Whether they have an en-suite bathroom or have to walk down the hall, a shower caddy is necessary to dorm life. This one is brightly colored, has holes along the sides and bottom for drainage, and dividers inside it to help corral all your toiletries. You cannot have enough versions of Command Strips and Hooks for a dorm room, but this particular one is important. First of all, it holds up to 7.5 pounds. Secondly, it can double, when paired with at least one more, as a curtain rod holder so you can mount those all necessary blackout shades. Or, if you’re into decorating, the pretty valance and curtains that you absolutely have to have to make the room perfect. Believe it or not, eventually your child will do their laundry, and this particular set up makes it a little easier. 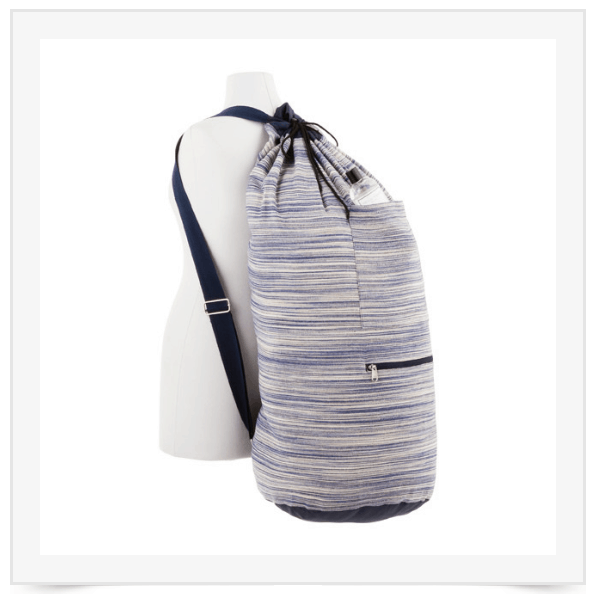 It can be used as a hamper to shove dirty clothes in during the week, and then when they’re ready to haul it to the laundry room, they can just carry it like a backpack. There are exterior pockets to hold detergent, dryer sheets, quarters, etc and an interior pocket as well. Obviously there are so many more items that you’ll need to fully set up your student, but in the few years that I’ve had a child in college, I’ve found these items to be essential to dorm life and easily adaptable to a fraternity/sorority room, apartment, or even travel. Let me know what items you’ve found are key in stocking your child’s dorm room-or if you’re a student yourself let me know what you found to be most helpful! 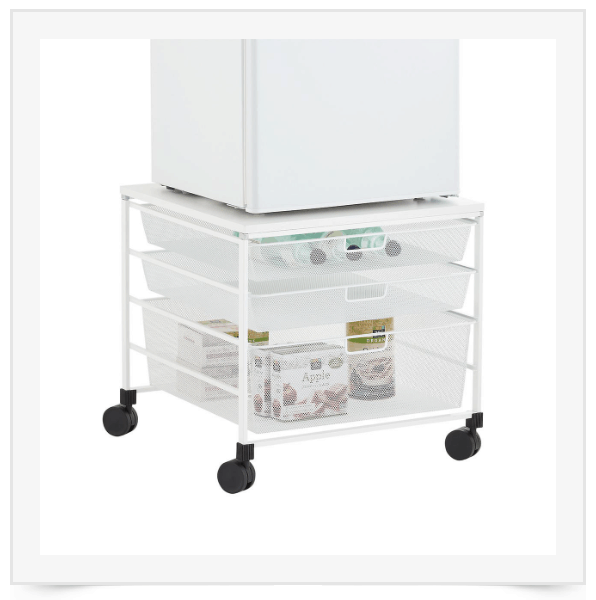 Ooooh, I’m getting that Elfa refrigerator cart for my classroom! 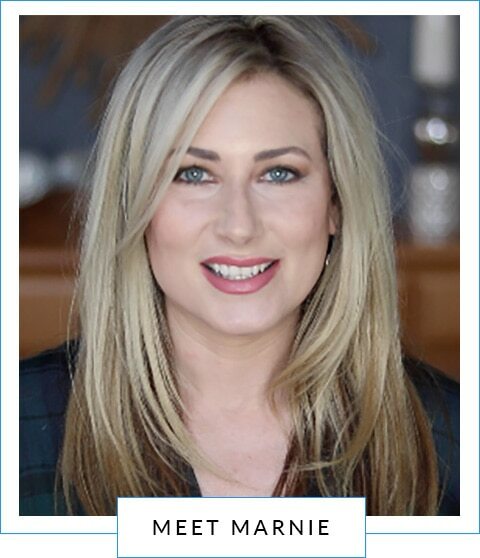 Love your writing style! Thank you! I think it would be great in a classroom-in fact I’ve seen it in quite a few over the years!